Had a brilliant ride with Paul yesterday morning. He was on his brand new 2011 Cervélo R3 and what a piece of machinery that is. I have always been a Cervélo fan. I love the fact that it is a Canadian company, founded and still headquartered in Toronto, and the two founders are still running the ship, almost twenty years on. 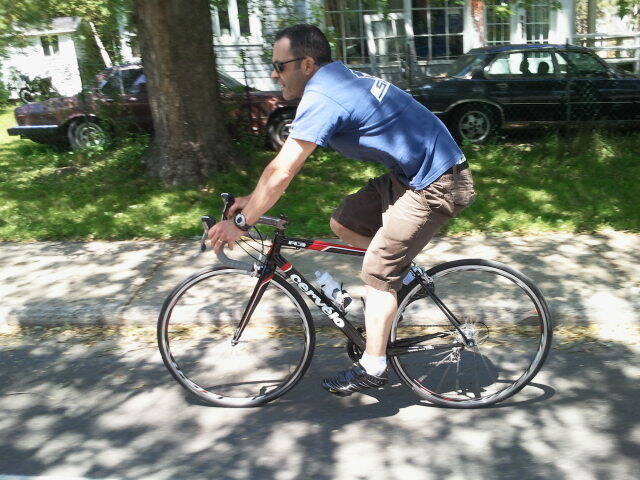 Paul test riding his new Cervélo R3 in civvies. But the main reason I love the brand is because they make bloody gorgeous looking bikes. Without doubt they are the best looking bikes in the Pro peloton today, and I dare say they are some of the best looking bikes in production anywhere. The R3 is no exception to this and once again the Vroomen-White design sets this bike apart from the rest of the hoy palloi. Paul’s understandably delighted with his new toy. Like a young boy who has just received his first catapult, there is a permanent grin plastered to his face as he pedals. And why not? It’s not everyday you change bikes and when you ride something that is quality it is a true pleasure. We rode 55 km in 1hr 47m and the time went flying by and the kilometres passed with relative ease. I am looking forward to the first time that I get to go out with both Paul and Andy, as I am now totally outnumbered when it comes to choice of bike brand. They both ride the Cervélo R3, whereas I am staying true to my Campy clad VR2. It may not have the brand recognition of their rides, but it can still teach them a lesson on occasion!